Creator Circa 2nd Century A.D.
Provenance Acquired by the current owner's father in Egypt in the 1920s. Lot Notes Several polyhedra in various materials with similar symbols are known from the Roman period. 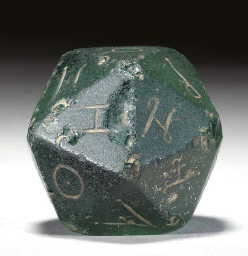 Modern scholarship has not yet established the game for which these dice were used.